Yesterday I attended my first Skopje IWA (International Women’s Association) meeting. The memberships is a young 20-40s mostly. I met women from Congo, Albania, US (mostly embassy wives), The Netherlands, and more. I’m going to enjoy their company. Already they have helped. The Epiphany Day celebration was explained. As a result of the announcement, today Dan and I went to see how Macedonia celebrates Epiphany. Not being familiar with the reason for Epiphany, I looked it up. Epiphany is the day that the three kings visited the baby Jesus. It is also the day that St. John the Baptist baptized Jesus. The celebration was set to begin at noon. Dan and I arrived at the river a little past 11 a.m. and the river was already lined with spectators. Beautiful orthodox a cappella voices accompanied us as we found our way down to the river. 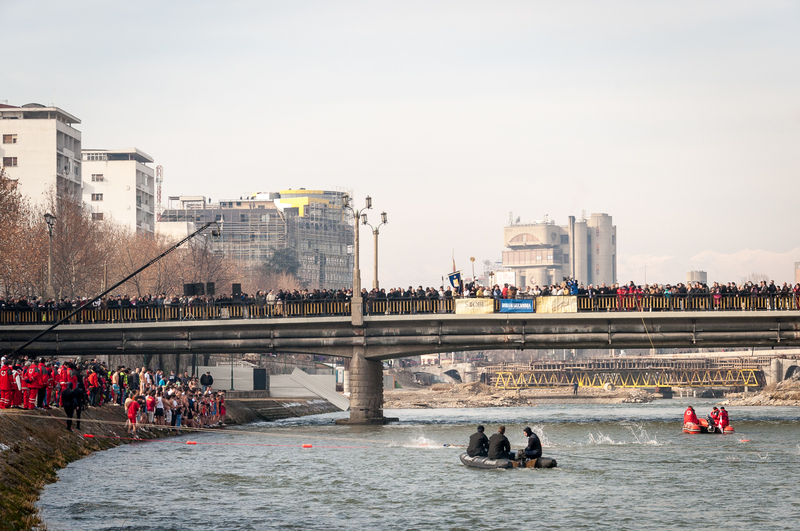 Next the head of the Macedonian Orthodox Church, Archbishop of Ohrid and Macedonia HH Stefan performed the Blessing of Water, dipping the Holy Cross and blessing the water of the river Vardar. He did this ceremony from a bridge over the Vardar. Then, HH Stefan tossed a wooden cross into the River Vardar, and 127 “believers” ran into the river to retrieve the cross. While the sun was out this morning and the temperature was warmer than previous days, it was still very cold with the temperature hovering just above freezing. River water that had splashed up on the sides of the river canal and on the walkways was frozen. A spectator told us that all participants are protected from harm and illness on this day. I had my gloves off while I was waiting for the cross to be thrown, and my hands felt like they were frozen stiff after just a few minutes. The winning “believer” was a second time winner. We were told that the one who catches the cross will enjoy happiness, health and good luck all year long. The winner also received a laptop from the Prime Minister, an icon from the Mayor of the center of Skopje, and a golden coin from the Mayor of greater Skopje. 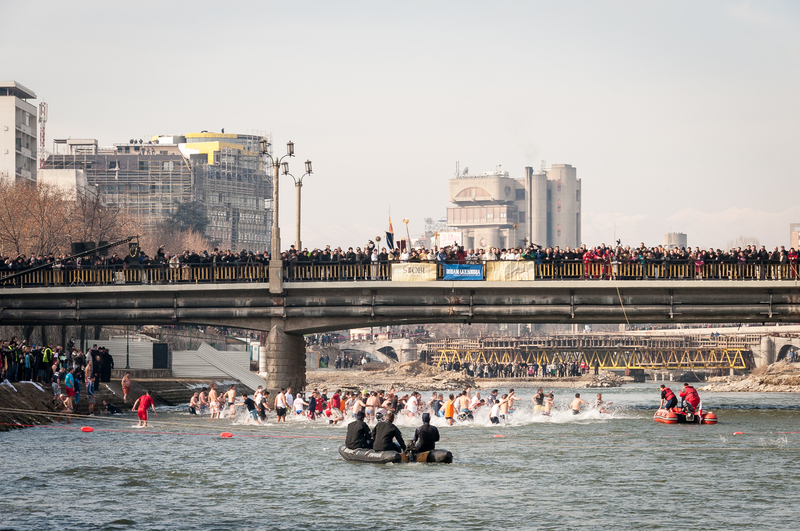 This year’s Blessing of the River marked the first ever woman participant running into the river. After the cross is tossed into the river, the river water is blessed and becomes holy. When the cross was retrieved, various spectators began filling bottles with river water to take back to their homes (hopefully not to drink). One of the emergency divers considerately filled bottles for some spectators. Note the ring of ice above the river level.